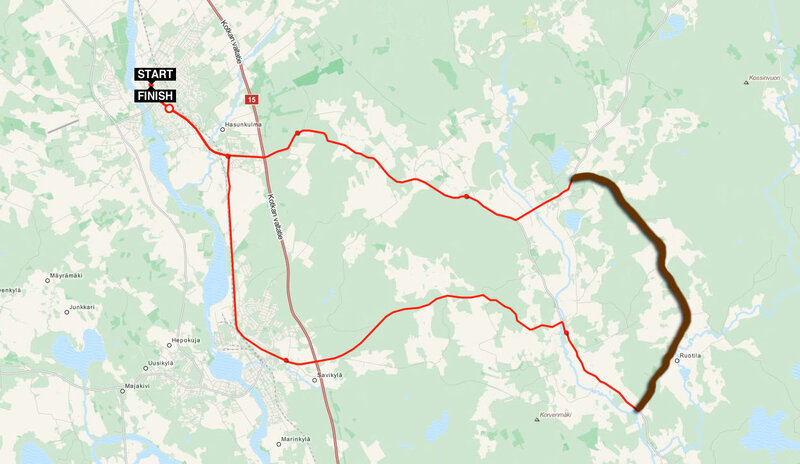 This note describes the circular cycle routes from the town of Myllykoski (Kouvola), 23 and 47 km. As I’ve wrote earlier, it was the first trip of the season of 2014, in mid-April. In Moscow it was still dirty and dusty. Somebody rode, but I kept the lungs. In Finland, on the road is much cleaner. I think this is due to the fact that in winter they not watered roads with reagents but strew granite crumbs. When the snow melts, it is removed and immediately road like in the summer. In Russia we need to have a couple of weeks of steady warm wheather to make possible wash of roads. The second cause of the dust – the absence of foliage. Here we have an equal position with Finland, but dust in April is considerably smaller in Finland. We had two days. 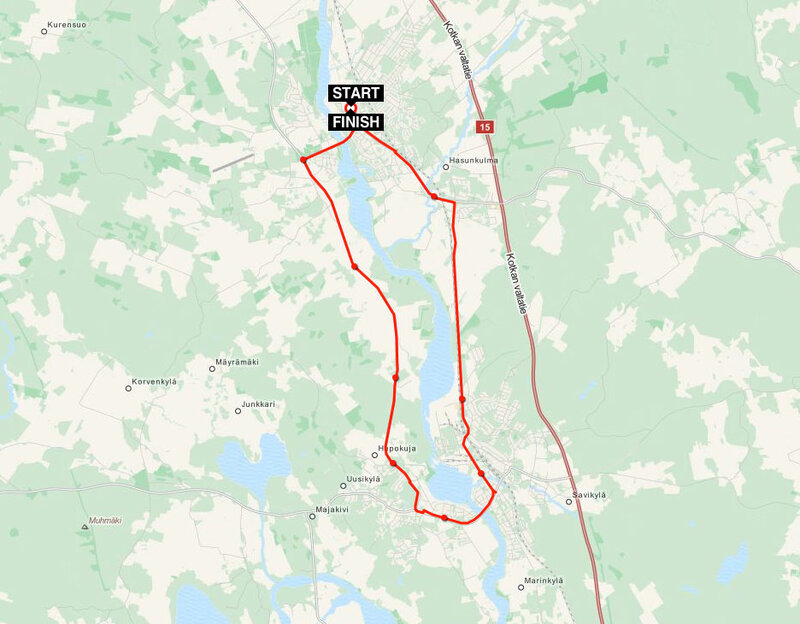 The first ride was made for 22.7 km. We rode to south from Myllykoski around Kymijoki (river Kumi). From 1741 to 1809 this river was the border between Russia and Sweden, at that time in Russia the river called Kumen’ (apparently from the present Swedish name of the river Kymmene). It is hard to say that in April is picturesque. In addition, despite the sunny and windless days it was quite cold. But the roads are empty and of good quality. In the picture we are on the road along the river from north to south. River rather felt than seen. But on the south turn of route on the bridge it is impressive. Broad and affluent. On the beach in some places still was visible ice. Then we went back on appeared the bike path. Bike paths are like one lane road, parallel to the main one. This way is also a pedestrian zone. According to the rules, if there are bike path, the rider has to drive on it. Pedestrians apparently also aware about it, as never occupy the entire road. Moreover, if a person walks with the dog, the dog is not on the road, and on the grass, and a person tries to walk on the edge of the track (not like here in Russia :)). 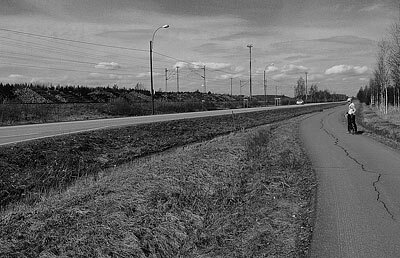 Sometimes a bike path runs along the highway outside the settlements and widely used for sports, in addition to cyclists there are runners and roller skiers. And, of course, such paths are always in the settlements. To many words to illustrate that we were not hurry to turn off the main road in the settlements, considering it as a pedestrian zone yet. Next day we laid the ring of 47.1 kilometers away from the river. Get with the notable hills. But, more importantly, a significant part of the road (in brown on the scheme) was not free from granite crumbs. The road itself is of good asphalt, but on top is 2-3 cm thick of crumbs. We thought they did not have time to clean after the winter. Later it turned out that it is not. On some sections of roads crumbs are not removed at all. I did not understand how it is possible to know about it when design the route. The search in local forums with Google translator gave nothing. Further I will designate such areas, which one had to wade.